London: The Leadenhall Press, E.C., ca. 1891. Comparatively few persons, even among antiquaries and historians, have the power of discerning the beauty which is held to underlie the productions of the earliest periods of artistic development; yet, if such beauty did not exist, the influence exercised by these works upon later achievements would be quite inexplicable. It is obvious that Cimabue’s Madonnas have now very few attractions for those who are not students of the history of art; yet the rejoicings with which one of them was accompanied in its progress through the streets of Florence to its resting-place in Santa Maria Novella were universal and sincere. From the earliest to the latest times, all true art is but the attempt, made more or less successfully, to realize and reproduce an ideal seen or heard in the imagination. As time goes on, these attempts become ever easier and more assured; the conventionalities which the earlier artists used to express themselves are gradually discarded, and greater freedom as well as greater beauty is attained. The period which lies between the abandonment of the archaic symbols and the formulation of laws founded upon just and cultivated observation, has a very special interest in the history of all the arts. In music, the youngest of the sisterhood, this stage of development was of course later than in the others. The hideous “organum,” or “diaphony,” for example — a mere lifeless sequence of consecutive fifths, fourths, and octaves — remained in use long after painters had discovered that the Byzantine masters’ representation of the human eye was not the most beautiful or veracious that. could be attained by the graphic art. This “organum” is the point of departure for the modern systems of harmony and counterpoint, and it is evident that the laws of these had to be gradually evolved from very rough beginnings. The transitional period in the development of an art that at length produced such gorgeous results as the English madrigals of the sixteenth century, cannot be without interest to musicians. 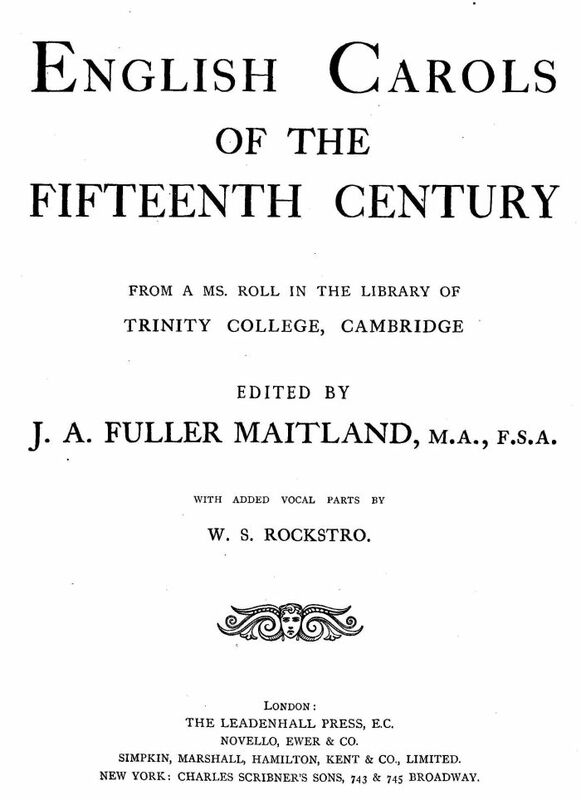 The series of carols contained in this volume shows the science of counterpoint in a very early and rudimentary condition, and from many passages it is clear that the influence of the “organum” was still strongly felt by the composer. Few of the songs have absolute melodic beauty such as would make them popular nowadays, or even as much as is possessed by the rota, “Sumer is icumen in,” which was probably written some two hundred years before these saw the light. They have a special value, however, since they are almost the only existing specimens of English music of the period, or at all events the only specimens which have not been tampered with before reaching us in their modern dress. They are especially valuable, moreover, as being almost without a doubt the work of one composer, and as enabling the rules by which their structure is governed to be clearly seen. In any single specimen of ancient music there is a strong temptation, too seldom resisted, to assign any glaring breach of modern contrapuntal laws to the error of some scribe; where, however, such peculiarities recur again and again, as they do in these carols, it is impossible that all should have been due to this cause, and we are therefore forced to regard one and all as intentional and even systematic. In the case of one of the songs (the “Agincourt Song,” as it is called), the existence of another old transcript of the music gives opportunity for a most instructive comparison of the two texts. (See Appendix.) The version given in the present series is in all probability the purer and earlier of the two. In the existing state of our knowledge, when very few specimens of fifteenth century music have been deciphered, it would of course be premature to assign the carols, upon internal evidence, to any particular composer; but certain peculiarities, to be noticed later, show so remarkable an affinity to the known work of John Dunstable, that it is difficult to avoid assigning them to him. The songs are contained in a parchment roll, 7 inches wide and 6 feet 7 inches long, on one side of which appear the carols, written continuously, as shown in the frontispiece (where the beginning of No. VIII. appears below the words of No. VII. without any division); on the other side is an ecclesiastical treatise in monkish Latin. The character of the handwriting, both in the words and music, points to the fifteenth century, and the date of the MS. is narrowed still further by the date of the battle of Agincourt, 1415. In W. Chappell’s “Ancient English Ballads,” Vol. II., p. 8, the “Agincourt Song” is stated to have originally been composed about 1417, but no authority is given for assigning so early a date to it. Many unusual forms of words, such as woyd for wood, nyth for nzqht, and others, mark the text as of northern origin. The words of some of the carols have been printed before; in T. Wright’s “Songs and Carols of the Fifteenth Century” our No. III. appears in a slightly different version (see p. v.) Whether the words of the whole set are by the same writer or not, internal evidence is very strongly in favour of the music being the work of one man. 1. The music and words as they stand in the MS., given without alteration, except in certain cases where a hiatus has evidently occurred from accidental causes (all such additions are mentioned in the notes to each carol, below). 2. The carols in modern notation, with the addition of parts for one or two voices, inserted in order to make the harmonic progression intelligible, and to render it possible to sing the compositions with more or less good effect The words have been slightly modernized, but as little altered as possible. No note of the music has been altered without remark, as may be seen from a comparison between the first and second divisions of the book; the added parts are the work of W. S. Rockstro, Esq., and are written in accordance with the contrapuntal laws which he has deduced from the original compositions. With his permission, the most important of these laws are here appended. They differ from those of the strict counterpoint of the sixteenth and seventeenth centuries mainly in being more free. 1. The discant lies above the canto fermo. 2. The permitted intervals are (for the first note, only the octave or unison—very rarely the fifth): the octave and unison; thirds, major and minor; the perfect fourth; the perfect fifth; sixths, major and minor; and rarely the minor seventh. 3. The perfect fourth is treated as a concord. 4. The seventh is rarely used in the first order (note against note), but is common in the second order. A curious example occurs in No. VII., in bar 12. The notation is “black void,” with triangular-headed notes; black and red “full” notes (the latter represented here by shading, not by colour) are used to indicate syncopations and other rhythmic peculiarities, but the colouring has no effect upon the duration of the notes, except in rare cases, as for example in No. IX., line 2, upper part, where three red full minims are used as the equivalent of two ordinary minims; and in No. XII., bar 6 from the end, upper part, where three red crotchets occupy the place of two ordinary crotchets. The usual measure is the “prolation of the more” (three minims); but cases are found of “perfect time” (three semibreves), “imperfect time” (two semibreves), and the “prolation of the less” (two minims). Strange proportions are not nearly so common as they became some fifty or a hundred years later; but instances of “sesquialtera” are. found—e.g., in No. 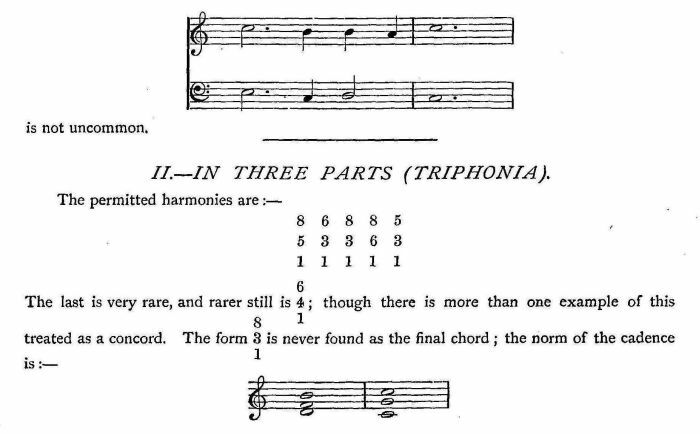 II., bar 3, lower part, &c.
Accidentals are left to be supplied by the laws of Cantus Fictus. The modes are all authentic; the canto fermo nearly always reaches, without exceeding, the limits of the mode. Any sacrifice of harmonious effect is made in order to secure a continuous and flowing discant. Imitation seems not to be attempted. The same rules are observed in all the carols. The similarity between certain passages is so remarkable (compare the opening bars of Nos. VIII. and XIII., &c.) that there can be little doubt that the roll is a genuine transcript of original works by one composer, not a mere collection of stray pieces popular at the time. The three-part writing in Nos. I., VII., and IX., bears a very close analogy to that in Dunstable’s “O Rosa Bella” (reprinted in Stephan Morelot’s “De la Musique au XVe. siècle,” Paris, 1856), and in Ambros’ history of music; although the latter is smoother and more harmonious than that of the roll, and contains points of imitation such as are absent from the carols, the form of cadence above mentioned, and other characteristic features, are common to both, and there is at least a possibility of the whole set being by Dunstable. NOTES ON THE TEXTS OF THE CAROLS. I. The lower part in the original evidently lacks a few notes at the beginning. These have been supplied conjecturally, as well as the clefs, which do not appear in the MS. until the third line of No. II. II. The “sesquialtera” in bar 3 (mod.) has been already pointed out. Line 3, bar 7, upper part (mod. ), exhibits an instance of the licence called “nota cambiata.” The correct text of the last line of stanza 2 is found to be, “To sle so ientyl a nowel.” The word “sle,” Mr Bradley informs me, is a common enough form of “slay.” The consecutive fifths in bar 16 are strictly in accordance with precedent. V. Notice the particularly prominent consecutive fifths in bar 6. The direction, “Da capo,” is conjectured from the fact that the words, “Be mery,” are placed at the end of the first stanza in the original. VI. The alteration in the tenor part at the words “rex pacificus,” line 2, bar 3, is noted in the modern part of the book. This is one of the most instructive passages in the roll, as it shows us the exact amount of appreciation for smoothness that the author possessed. The quotations from well-known Latin hymns will not escape attention. VII. For remarks on this song, and for the other version of it, see Appendix. IX. This, it will be perceived, has been translated into notes of half the original length. It is just possible that the consecutive fifths, eight bars from the end, arise from a clerical error, and that the last two notes in the middle part should be D and C.
X. The metre of line 3 of stanza 4 demanded some alteration in order to fit it for the music. Either the omission suggested in the modern part of the book, or that of the words “he said,” must be made. XI. The alternation of English and Latin lines in this carol recalls the old Latin and German song, “In dulci jubilo.” No music is given for the “Amen” at the end, and it will be better in performance to leave it out. A few remarks as to the performance of the songs may not be out of place. They may be sung by one or more voices to each part; if it is desired to obtain the actual effect of original compositions, only the parts in large type must be sung, and the added parts omitted altogether. An effect more tolerable to modern ears will be obtained by singing all the parts together, but without accompaniment. Failing this, the condensed score which appears below the vocal parts may be treated as an accompaniment while the original (large type) parts are sung, but it must be borne in mind that the effect of the frequent dissonances, when played on a keyed instrument tuned in equal temperament, is far worse than when the parts are sung. It will require a little attention to fit the words of the stanzas other than the first to the music, but no great difficulty should be felt in doing this by singers of ordinary intelligence. My thanks are mainly due to Mr Rockstro for the pains he has taken to ascertain the exact laws which govern the composition of the carols, and for the skill with which he has accomplished the difficult task of filling up the additional parts. To the fellows of Trinity College, Cambridge, for permission to copy the roll, and to the Librarian, the Rev. Robert Sinker, MA. ; to Mr Rogers, of the University Library, Cambridge, who prepared an accurate working copy of the MS.; to Miss Alice E. G. Carthew for assistance in making the facsimile; to J. Godfrey Luard, Esq., by whom the Oxford version of the “Agincourt” song was copied from the original MS. in the Bodleian Library; to F. J. H. Jenkinson, Esq., M.A., University Librarian, Cambridge; and to Henry Bradley, Esq., for valuable help, I have to offer sincerest thanks. Students of poetry will perhaps expect me to apologize to them for having treated the words of the carols as of secondary importance, but it must be remembered that collections of early poetical efforts are a good deal more numerous than collections of ancient music; and that while the words of these songs are a very slight addition to the poetry of the period, their music is almost all that musicians possess of English origin between the years 1250 and 1500.